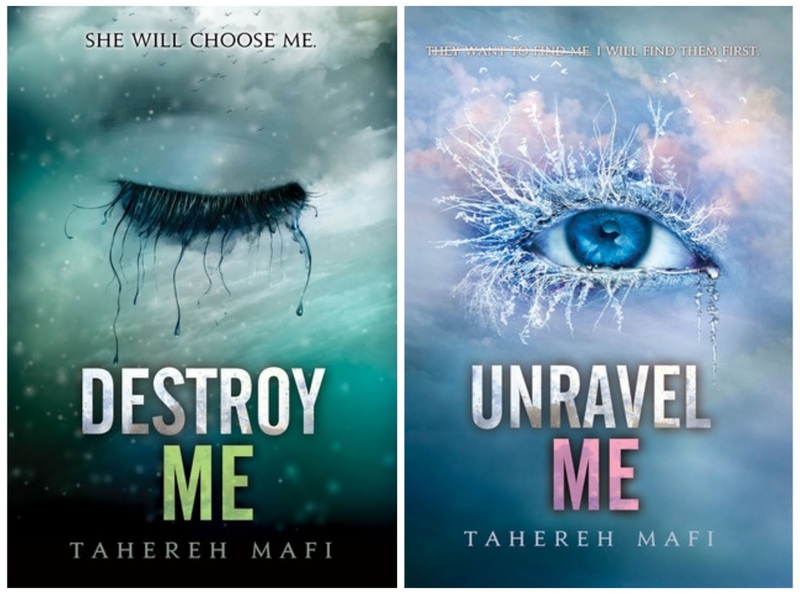 Summary: These are the next two installments of the Shatter Me series, and therefore, this review will contain spoilers of the first book. To read my review of the first book, please click here. Destroy Me is a novella told from Warner's point of view, covering the approximate period of his being shot as well as the immediate aftermath. We are introduced to the Supreme Commander of the Reestablishment, his father, who is absolutely ruthless and who is upset (major understatement) at how his son has handled the entire Juliette situation - basically, it was a major FAIL that he ended up falling in love with her. Unravel Me is the second full novel in the trilogy: Juliette, Adam, and his brother James are settling into life at Omega Point, the rebel movement consisting of many other "people with abilities" led by a man named Castle. Or rather, Juliette is having a difficult time settling in, and things get worse when she discovers that Adam's special ability complicates their intense romance. When a hostage situation brings Warner to Omega Point, and Juliette has some realizations that complicate her relationship with Adam even more, she starts to question whether or not she really is the monster that everyone has always said she is. Thoughts: First, the novella. I wasn't sure if I wanted to read it, because I wanted to proceed with the main story, and I wasn't super keen on Warner at the time. But it was released second chronologically, so I figured I might as well. It does a great job of humanizing Warner, which really helped me empathize with how Juliette feels in Unravel Me when Warner shows up again in her life. It's not a plot-heavy story (so there aren't really any spoilers), but basically it shows what Warner's side is and what his life is like, and how Juliette has changed him, especially after he finds her journal (the notebook she was keeping in the asylum). I wasn't a Warner fan before I read this, but it definitely helped change my mind, especially since Adam and Juliette were starting to really bug me in Unravel Me. I honestly couldn't tell if that was the intention or not - were we supposed to feel as torn as she was, or were we supposed to feel kinda "over it"? And don't get me wrong, I was shipping them hard in the first book, but with the complication that comes up in this one, there was a lot of overwrought "I LOVE YOU. I NEED YOU!" / "BUT WE CAN'T DO THIS!!!" sort of business, and I tired of it. One of the best things about this second book is the expanded role of Kenji, a character that shows up towards the end of the first book. First of all, he's of Asian descent, so YAY! Second, he's frickin' awesome. He provides a lot of comic relief, but he also gives Juliette a lot of tough love. He has one particular Come-to-Jesus sort of speech in this book that made me want to stand up and applaud. I swear, if it weren't for Kenji, this book would be getting at least one star fewer. I also liked reading about the other specially-abled individuals at Omega Point. It was a bit like X-men - one guy can manipulate electricity, there are twin healers, and Kenji can go "invisible" (well, he can blend in with his surroundings like a chameleon). It's a little unclear what specifically is Juliette's power - we know that touching her is lethal, but we also saw in the first book that there were unbelievable displays of power and strength, like breaking through a concrete wall. She works on honing this power a little more in this book, but struggles because so far, it has only manifested itself during extremely heightened emotional states. Before you comment, remember: respect and patience go a long way.